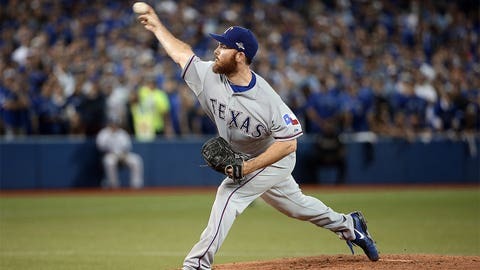 Thursday in Toronto, it was Texas right-hander Sam Dyson, not Shawn Tolleson, who was called on to close out the Blue Jays 5-3 in Game 1 of the ALDS. Neither is exactly a household name, but understanding the usual dynamics of the Rangers bullpen is understanding a key team component that allowed them to charge to the playoffs. For the first few months, that bullpen was a liability. Then it quietly improved, turning into the strength the Rangers have today. Dyson very quickly made himself the eighth-inning guy, serving as a bridge to Tolleson in the ninth. Thursday, it wasn’t that Tolleson didn’t have manager Jeff Banister’s trust; the skipper just preferred Dyson’s sinker against the bats the Blue Jays were going to send up. That much doesn’t not make sense. Dyson arrived in a deadline trade that received minimal attention, but he was thrust into a role of importance that he hasn’t given up. In thinking about what the Rangers did, it’s worth reading a wonderful article about the Nationals by Barry Svrluga. The Nationals wouldnât trade pitcher Lucas Giolito, one of the top pitching prospects in the game. They wouldnât trade shortstop Trea Turner, who they thought might be the replacement for incumbent Ian Desmond someday. The Reds and Padres each wanted two of the Nationalsâ top five prospects. Rizzo moved on. Any team would’ve heard the same story — a shutdown reliever at the deadline is going to cost you. Neither Kimbrel nor Chapman were moved because they were deemed too expensive. Rizzo went the Papelbon route and was OK with that at the time. Meanwhile, Texas GM Jon Daniels went another route. With Cole Hamels, he got the Phillies to include Jake Diekman. And Daniels picked up Dyson from the Marlins, giving up a minor-league reliever and a third-string backstop. Few would raise eyebrows in response, but it looks like a stroke of genius today. No matter how you look at it, Dyson comes out looking fantastic. The Rangers didn’t trade for one of the big-name relievers, and as far as I know, they might not have even tried. Maybe that idea didn’t interest them much. They went the cheaper route, betting on stuff instead of track record, and since then Dyson has been arguably the best reliever in baseball. Dyson is not the best reliever in baseball, but he’s very obviously working out, improving since getting to Texas. Sometimes the best trades are the ones not made. Ssometimes the best trades are the ones made instead of other ones. By runs per nine, Dyson improved by nearly two-thirds. Improvement is also apparent in other, supporting places. The Rangers didn’t trade for a reliever who was already doing well — they traded for a reliever they thought would do well. Since getting dealt, he’s generated more grounders. He’s thrown a lot more strikes. He’s gotten a lot more bad swings. He’s in more control of his strikeouts and walks. That didn’t happen by accident. Earlier, with the Marlins, fewer than half of Dyson’s pitches were sinkers. With the Rangers, more than two-thirds of his pitches were sinkers. They’ve been thrown at the expense of sliders and four-seam fastballs, and, obviously, Dyson hasn’t looked back. It wasn’t long ago that he was proud of how his slider had improved, after a change in grip, but as Dyson has demonstrated on the Rangers, his sinker is almost enough on its own. Minor-league teammates used to call him "Bowling Ball" for a reason. Visually, it’s an impressive pitch. Statistically, it’s an impressive pitch. The gun reads 97 on the pitch to Tulowitzki. Pitchers are usually taught to diversify, the argument being that when throwing multiple pitches, hitters can’t know what’s going to come. Seldom is there a pitcher who works with one pitch extremely often, but Dyson can be one of those guys, because his sinker seems to be good enough. It passes all the necessary tests. PITCHf/x is a system that tracks every pitch thrown in the major leagues. Using PITCHf/x data, we can search for Dyson sinker comparisons. We know, because of the system, how fast Dyson throws his sinker, and how it moves both horizontally and vertically. So we can look for other pitches with similar traits. I’ve worked through my formulas, and the No. 1 comparison for Dyson’s sinker is Zach Britton’s sinker. The sinker Britton threw 90 percent of the time en route to a fantastic season as closer. Comparisons don’t get much more flattering. Granted, Britton is a southpaw, but you get the idea. Pitchers like Jared Hughes and Carson Smith get movement similar to Dyson, but Dyson throws several ticks harder. Velocity means more and more, the higher it gets. The Rangers made a bet that Dyson would improve if he simplified. It cost them very little to find out, and it turned out they were correct to gamble on what appeared to be a special pitch. By going to his sinker more often, Dyson has taken off, closing the first game of the ALDS against the best offense the game has seen in a while. The Rangers want Dyson’s approach to be fairly similar to Britton’s. Tthat much makes sense, because Dyson is a lot like Britton, who is one of the better relievers in the game.